Schizophrenia is characterised by a multifactorial aetiology that involves genetic liability interacting with epigenetic and environmental factors to increase risk for developing the disorder. A consensus view is that the genetic component involves several common risk alleles of small effect and/or rare but penetrant copy number variations. Furthermore, there is increasing evidence for broader, overlapping genetic-phenotypic relationships in psychosis; for example, the same susceptibility genes also confer risk for bipolar disorder. 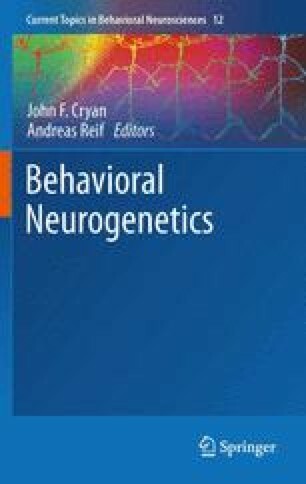 Phenotypic characterisation of genetic models of candidate risk genes and/or putative pathophysiological processes implicated in schizophrenia, as well as examination of epidemiologically relevant gene × environment interactions in these models, can illuminate molecular and pathobiological mechanisms involved in schizophrenia. The present chapter outlines both the evidence from phenotypic studies in mutant mouse models related to schizophrenia and recently described mutant models addressing such gene × environment interactions. Emphasis is placed on evaluating the extent to which mutant phenotypes recapitulate the totality of the disease phenotype or model selective endophenotypes. We also discuss new developments and trends in relation to the functional genomics of psychosis which might help to inform on the construct validity of mutant models of schizophrenia and highlight methodological challenges in phenotypic evaluation that relate to such models. The authors’ studies are supported by Science Foundation Ireland Principal Investigator grant 07/IN.1/B960 and Health Research Board of Ireland Postdoctoral Fellowship PD/2007/20.